Click the button below to add the Koa Nanea Hairbrush to your wish list. 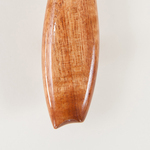 Our classic small oval hairbrush in choice koa wood, handmade in our Big Island shop. Perfect for a travel or purse brush, the heirloom craftsmanship promises many years of treasured service. Options include three types of bristle configurations for the pneumatic hairbrush head and two handle types. For the bristle type, choose the pin with a ball head for thick hair, the pure boar bristle for a gentle touch, or the boar bristle with straight pins for an intermediate feel. Please note that there is a vent hole in the pin with ball hairbrush head. The "puka" (hole) is part of the design of the pnuematic head. It allows the brush head to breath and flex as the bristles are pulled through the hair. Each brush is unique in its color and figure and is finished in an extremely durable marine grade varnish. As your brush ages it is possible to replace the head with a new one, but it is necessary to send the brush back to us. Over the years we have purchased 6 of your hairbrushes and one replacement brush....we love our brushes and the family members we have purchased them for love theirs too. The Boar bristles are the very best for distributing hair oil without scratching or irritating the scalp. We have vacationed in Hawaii for 20+ years and know how valuable Koa wood is so love having "a little piece or Hawaii" as well as a wonderful hair brush....Mahalo! Terrific hairbrush for my long, fine-textured hair! I am a senior lady with long hair and this brush is fantastic. The lovely Koa wood handle and back makes it even more special. Thank you for the superior craftsmanship. A fabulous gift for your loved ones! Iʻve ordered before, the service is wonderful and quick, these hairbrushes will be gifts. All arrived safely, beautifully gift boxed, each brush lovingly handcrafted, and of the highest quality of workmanship. I know the recipients will appreciate having a special gift that will bring them pleasure for years to come. Thank you, Mahalo nui loa! I rate with 4 stars only because I have not personally used what I purchased. These will be gifts but I'm sure they will be valued by the new owners. The brush is beautiful and my scalp and hair are happy. Your marketing explained to me for the first time why I love the look of boar bristles but boar bristles don't please my scalp. I've always had a brush with pins and they are ugly. I ordered the combination of boar bristle with pins and have the best of both worlds. I ordered the small brush as a trial and will certainly be ordering another later. p.s. it is also grand how you have the replaceable brush heads. Excellent! Superb Hair Brush in All Ways! I have bought a few Koa hair brushes before but have to say this one surpasses them all in quality and feel. The wood is truly beautiful and makes me want to display the brush instead of using it. But the brush itself works so well there is no way I would not use it, just the right combination of stiffness and softness, a really great feel! Mahalo, for such a beautiful product, I will probably order another one soon! This fits perfect in my hand, and is just the right size to take traveling with me. Iʻll always have a most beautiful part of the Hawaiian Islands with me, part of a koa tree that was nourished by the earth and sustainably harvested with respect for the forest. Thank you so much, Dave and family for your wonderful work. Iʻm so happy with my Nanea hairbrush!